Dwight Parry is a study in contrasts. On one hand, he’s an intensely focused, exacting, world-class musician. On the other, a gregarious, adventure-craving extrovert, who loves people, enjoys exploring new things and truly values being part of the fabric of the city he now calls home. The first thing that strikes you about Parry is just how upbeat he is. He always has a welcoming smile, a hearty handshake, and an interest in you, as a person. But when the subject turns to his work, to making music, yin shifts to yang. A focus emerges. A seriousness of purpose. 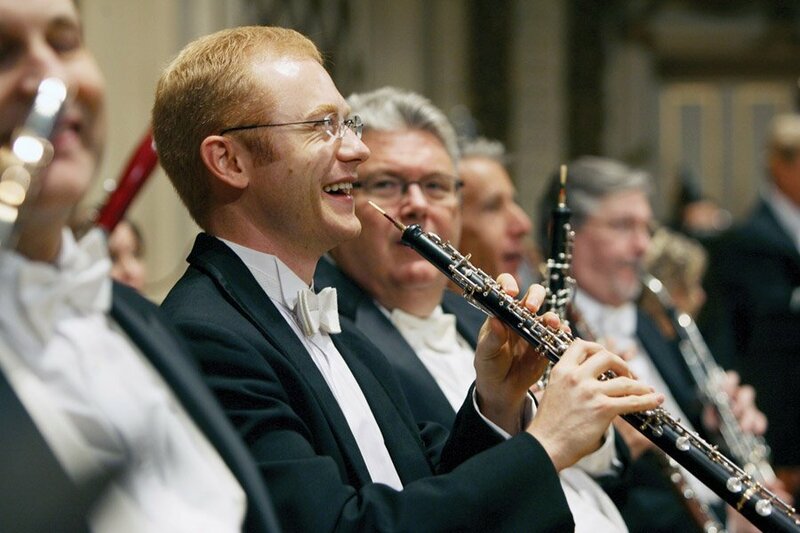 Now in his 10th year as principal oboist of the Cincinnati Symphony Orchestra, Parry is about to step out as soloist – Feb. 3-4 at the Taft Theatre – in the exuberant, yet daunting Concerto for Oboe and Small Orchestra, written in 1945 by Richard Strauss. Even though it was 2 p.m. when we got together, Parry hadn’t yet had lunch, having endured a morning packed with student “juries” (performance evaluations) at Northern Kentucky University, where he is adjunct professor of oboe. Parry also teaches at the University of Cincinnati College-Conservatory of Music. He performs with cutting-edge chamber ensemble concert:nova. He is a very busy guy. His father was a dentist. His mother worked in the practice as office manager. His sister played the clarinet, but later chose a different path “to get out of big brother’s shadow.” She now “catches babies” for a living, as a midwife. “That’s what they call it!” he said, enjoying my look of disbelief. Parry began studying piano at the age of 4, then took up the saxophone in the fifth grade. He played lead alto in jazz band all the way up into college. Jazz was to be his musical future, until his class schedule (advanced chemistry, he thinks) conflicted with jazz band, and he was encouraged to try the oboe. He literally asked, “What’s an oboe?” before agreeing. Parry earned his master’s degree at the Cleveland Institute of Music under the tutelage of John Mack, then principal oboist of the Cleveland Orchestra. His first orchestra gig was with the San Diego Symphony, before earning the principal job here in 2007. The defining element of the oboe is the reed – a double reed, to be exact. The sound is produced by two pieces of cane vibrating together. Oboists have an often obsessive relationship with their reeds. Choosing and “shucking” the right piece of cane is the most important thing. “It’s like being a chef,” he said. As he scrapes the reed, he analyzes color and even taste to evaluate the quality. Eventually, if it “squawks just right,” he knows he’s on the way to a good reed. This exactitude could be inherited from his dentist father, and it certainly carries over into his musicianship. “Dwight is a very fastidious player, in the best sense of the word,” said CSO principal English hornist Chris Philpotts. “He wants it to be the best it can be, and he wants that from (the oboe section), as well. The English horn is the alto big sister to the oboe. “He’s a terrific colleague who has a keen vision of the music,” said Chen. He is “efficient in suggesting fixes to create unity in our musical product, and always sensitive to textures of nuance and color.” Chen is also artistic director of concert:nova, with whom Parry performs occasionally. But with all this focus at work, Parry craves interacting with the real world. Last year, he took his sax out for a spin for the first time in eight years, for an open mic night at Stanley’s Pub in Columbia-Tusculum. Just for fun. “They had no idea who I was,” he chuckled. “Any time I have a spare minute, I’m on some adventure.” Parry grew up caving, hiking and dirt biking with his father in Southern California and northern Mexico. “I’m more cautious now of my hands and potential injury, so now I hike,” he said. Hocking Hills and Red River Gorge are favorites, but he also enjoys “sussing out” little-known nature enclaves in and around the city, such as the McCullough Nature Preserve. He also enjoys dabbling in the kitchen.